This was supposed to be a triumphal year for Brazil and its President, Dilma Rousseff. The first woman to be elected to that office, Mrs. Rousseff was the protégé and successor to the popular Luíz Inácio (Lula) da Silva; she had inherited in 2011 a government with sound finances, a burgeoning middle class and the opportunity to host the wildly popular World Cup in 2014. This year, Brazil is supposed to host the 2016 Summer Olympics, which would have been the showcase for a modernized country that had successfully escaped the “middle income” trap of developing nations. Instead, the Brazilian economy has been in freefall for almost 8 consecutive quarters, the country is facing a new and frightening pandemic disease, the work for the Olympics is far behind schedule and Mrs. Rousseff’s Administration is being rocked by such horrendous corruption scandals that the Congress is weighing her impeachment. Instead of a triumphal year, Brazil has entered the year of ungovernability. The political trouble started almost as soon as she had been sworn in for her second term; an investigation in the south of the country led the Federal Police to a known money launderer, Alberto Youssef, who had made a “gift” of a Range Rover to the Director of Supplies of Petrobras, Paulo Roberto Costa. As arrests were made and bargains were struck, the trail led to a clique of corporate executives, middle men and politicos who were engaged in a number of illicit activities including: money-laundering, price fixing, illegal campaign contributions, and bribery, sums totaling over 2.1 billion reais (USD 1.3 billion at 2012 exchange rates). This led to the arrest and indictment of 11 senior executives from four Petrobras suppliers, 3 top Petrobras executives and more than 50 politicians, all but one of them related to the Rousseff coalition. To find so extensive a list of allegedly corrupt public figures, one would have to go to Spain, where there are over 2,000 under varying degrees of indictment. These were not minor officials either; implicated are the President of the Senate, the President of the Chamber of Deputies, the Treasurer of the Worker’s Party, and numerous other Senators and Deputies. The list continues to grow and this Friday, the popular former President Lula da Silva had his house searched by the Federal Police while he was taken into temporary custody to make a declaration. The implications of this magnitude 9 political quake go far beyond Petrobras or the Rousseff Administration. It highlights the way things are done in the country, the virtual impunity with which major corporations can carry-on their “business as usual” shenanigans and the insignificance of the well-being or wishes of the average Brazilian amongst all the sordidness. 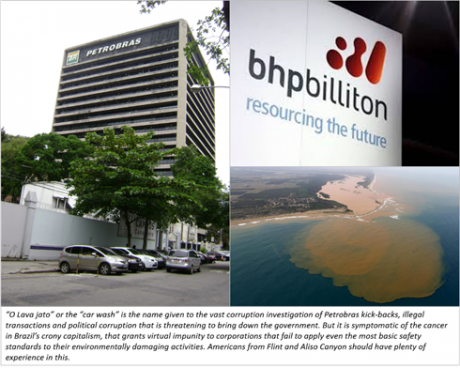 In November 2015, a retaining dam burst at an iron mine belonging to BHP Billiton and Brazilian JV partner Vale. The resulting flood of toxic waters, containing fatal concentrations of arsenic, mercury and other heavy metals, flowed down the Rio Doce, killing 17 people and destroying aquatic life for 500 miles until emptying into the South Atlantic, where it has also played havoc with coastal fisheries and ecosystems. The companies have recently agreed to a settlement of USD 1.55 billion in damages, but there will be no investigation of possible criminal negligence in the dam rupture; and while the damages are certainly large, they represent less than one quarter of profit for Vale SA, which earned USD 1.68 billion in the second quarter of 2015 alone. Petrobras and Vale may be the most egregious examples of unpunished corporate malfeasance, but they are not the only ones. Norte Energía SA and the government continue to push for the construction of the Belo Monte Dam on the Xingu River, despite the required displacement of over 40,000 indigenous peoples, large cost overruns, uncertain returns on the investment and grave concerns over the long-term ecological impact on that region of the Amazon. Guanabara Bay in Rio de Janeiro – home of the swimming and sailing events in the upcoming Games – is so polluted thanks to lax enforcement of clean water standards and State government’s lack of funds that mass fish die-offs are a common occurrence. Not all of Brazil’s troubles are related to corruption or cronyism. The country rode the wave of high commodity prices during the mid-2000’s, while the real estate sector boomed thanks to government subsidized building initiatives as well as the demand of a growing middle class. But the drop in oil prices and the turmoil in China’s economy – Brazil’s most important export destination – have caused the bottom to fall out of the two main motors of growth. The economy began to contract in the first quarter of 2014 and Brazil’s GDP has now been falling for 7 of the past 9 quarters. This is technically known as a depression, the worst that the country has suffered in two decades, and there is no end in sight. One area where prosperity was most evident was in the urban property markets. Housing prices almost quadrupled in Sao Paolo in real terms between 2008 and 2015 while historically low interest rates encourage many first-time homeowners to take out a mortgage. But the worsening economic situation has led to a rapid increase in interest rates, squeezing those first-time buyers the monthly payment on a modest R$250,000 two bedroom home has gone from R$4,950 to R$7,680. This is above the median income of R$7,440 and has led to a spike in defaults as well as reducing the disposable income of households for discretionary consumption. Consumption has also suffered due to the softening of the formerly resilient labor market. Although unemployment rates are nowhere near the disastrous levels of Southern Europe, they are worrying enough to the Brazilian government, which is paying out more and more in benefits to the unemployed at the time its revenues are decreasing. Brazilian families are not only worrying about their employment prospects and the increase in their mortgages; they are nervous at the rapid increase of inflation. One of the principal achievements of Fernando Henrique Cardoso, Lula’s predecessor, was a series of important economic reforms including a taming of the persistent and damaging inflation. The current spike in inflation is by no means unwelcome in an overly indebted nation, but many older Brazilians still remember the days of hyperinflation and rightly dread any hint of a possible return. Meanwhile, the Central Bank is limited in its ability to combat this inflation; any significant increase in interest rates will only compound the contraction in the real economy. For those Americans of my generation or older, we well remember this unwholesome situation by the ugly name of “stagflation”. Household consumption, business investment, manufacturing and services PMI, exports: all the key components of GDP are moving powerfully in the wrong direction. The only component which has increased has been government spending. The federal budget deficit stands at 10% of GDP, a necessary and non-discretionary increase in response to increased unemployment claims and fiscal stimulus. 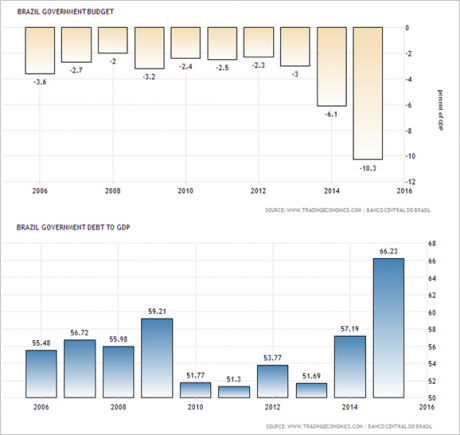 The debt-to-GDP ratio has increased tremendously under the dual impact of fiscal expansion and economic contraction and the Brazilian government is finding it increasingly difficult and expensive to meet its financial needs since all three credit agencies have downgraded the Brazilian bond to junk status. The sickness of the Brazilian economy may very well spread; and not only to her South American neighbors, whose economies are dwarfed by the verde amarelho giant. There are a number of European and American multinationals who are highly exposed to Brazil and likely to suffer the all-too predictable consequences, starting with two of beleaguered Spain’s flagship companies: Telefónica and Santander. Both companies derive almost half of their revenues from their emerging markets operations and Brazil is the largest component of these; Santander doubled down on its investment last year with the purchase of the outstanding shares of its Brazilian unit for USD 5.2 billion. Nor are they the only ones, sickly Europe has a larger exposure to emerging markets than American firms do, on average. The combination of a soft global economy and a paralyzed government makes a possibility of a natural or quick recovery seem remote. Mrs. Rousseff’s government is in no position to make any of the necessary reforms to encourage investment, reduce the country risk and prime the macro-economic pump; the only reason that her government has not yet fallen is that so many of those who would be impeaching her are themselves implicated. Nor is it likely that a sudden rise in oil or a sharp increase in demand for Brazilian commodities will generate an export-led growth. Paralysis, malaise and deepening woe seem the most likely future in the short-term, unless fate lends a helping hand through some external agency.